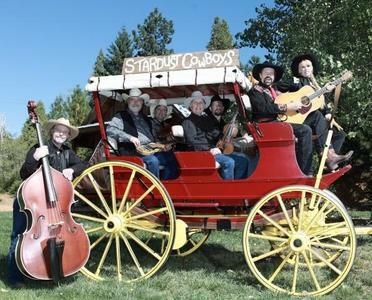 The Stardust Cowboys, a Northern California based band, play a blend of Original tunes, Western Swing Traditional tunes, and honor both the Cowboys of Yesteryear & Silver Screen with songs about the Old West. Fans will tell you they are known for down home humor and enthusiastic stage energy. You’ll hear Bob Wills Texas style western swing followed by old-time cowboy tunes. Their originals are written distinctly in a cowboy swing flavor and about living life in the hardy setting of the western country. This group stacked with song-writing talent and honorees in Western Music, has energized crowds throughout California, Nevada, Oregon, Washington, Montana & Canada for more than 25 years at nightclubs, casinos, fairs, rodeos, regional concerts, cowboy events & many name act openers. It’s not Country-Western folks – it’s Cowboy ‘n Swing and the sounds of the west in a family friendly setting!